Recently I wrote an article titled, "The Road to the White House and Control of the Senate Drives Through Ohio". As we come down to the wire, this race is neck and neck. 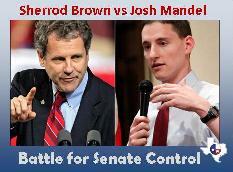 Ohio State Treasurer Josh Mandel is challenging incumbant Senator Sherrod Brown. Brown recently earned the label of the Senate's most liberal senator, according to Mandel. Previously, I interviewed the National Rifle Association's Jacqueline Otto about the importance of the Ohio race and what the NRA-ILA was doing to help Josh Mandel. Otto told me that Josh Mandel was rated with an A from their organization and Sen. Brown had earned an F just like President Obama. Friday, national radio talk show host, Glenn Beck interviewed Mandel and Florida Senator Marco Rubio as they crisscrossed the Buckeye State while early voting was coming to a close. In describing between him and his opponent, Mandel told Beck, "He’s never seen a regulation he didn’t like or a tax he didn’t hike, and I’m a proud full spectrum conservative. While I am a Republican, I’m a conservative first and I’m a constitutional conservative." On the basis of fiscal conservatism, Mandel told Beck, "Well, I think we need to make aggressive cuts in our federal government quickly and, you know, there’s a lot of Republicans who disagree with some of the things I stand for. For instance, many Republicans will say, you know, we can’t touch defense spending as well. I actually believe we need to do a top/bottom review of all of our bases throughout the world and, for instance, in Europe we’re not fighting the Nazis anymore, we’re not fighting the Cold War anymore. We could probably trim down or shut down some of our installations." Sen. Rubio told Beck, "I think people understand the choice of this election is not just between two people. It’s between two very different views of our government’s role and our future and what America should be, what America should remain. And, you know, I think you’re starting to sense that from people as you talk to them." I believe Sen. Rubio is correct. The people of this country may be divided, but when the dust settles Tuesday and Wednesday, we will see clearly, the American people have chosen Gov. Mitt Romney to be the next President of the United States. The road to the White House and control of the U.S. Senate clearly runs through Ohio. The candidates have worn that road out with campaigning all over the state. Now it is up to you, the voters, to get up off the couch, out from behind your desk, away from your workplace and homes and get out and vote! GLENN: That’s what’s going to happen. They are running out of “I voted” stickers in Texas. In Texas. I mean, Texas is like it doesn’t ‑‑ I’m not going to really count in the presidential election. But they are running out of “I voted” stickers here. That’s fantastic. In Ohio things are dicey. I personally think if it’s not stolen, you are going to see an amazing upset in almost all of these states. We have one of the guys who’s running, he’s state treasurer now, he is running for Senate against Sherrod Brown. I’ll let Josh tell the difference. We have Josh on the phone. Also Marco Rubio is on. Is he on the same line? STU: Yeah, they’re separate ‑‑ I think they are sharing the phone there, with each other. GLENN: Is this a party line? Is that what’s going on? MANDEL: Hey, Glenn, how are you doing? GLENN: Good. How are you. Is this Josh? MANDEL: Yeah, this is Josh on the party line in Cleveland, Ohio. GLENN: Marco, where are you. MANDEL: He’s coming. He’s out in the diner shaking hands with some folks. GLENN: Okay. So Josh, first of all, what’s the difference between you and Sherrod Brown? MANDEL: Well, he was named the most liberal senator in the United States of America, he’s never seen a regulation he didn’t like or a tax he didn’t hike, and I’m a proud full spectrum conservative. While I am a Republican, I’m a conservative first and I’m a constitutional conservative and in Washington some of the Republicans are oftentimes just as much a problem as some of the Democrats and we need to elect more senators like Senator Rubio and others who will stand proudly as conservatives to do the right thing for our country. MANDEL: Small government conservative. I believe the private select ‑‑ private sector is the solution to our problems. When it comes to a lot of our social woes, I think we should look to religious organizations and nonprofit organizations oftentimes before we look to government. And I also believe that while so many politicians, my opponent and others think that the federal government is the answer, I think Washington’s the problem. Is the more we can get Washington out of the way, the stronger our economy and our country will be. GLENN: So you’re the treasurer in Ohio State and ‑‑ which is fantastic, because you obviously are a numbers cruncher. The financial cliff that is coming our way and all the trouble we’re having. If we don’t change the course now, how long do you think we have? MANDEL: Not very long. It’s ‑‑ we are running 100 miles per hour down the tracks and it’s I believe soon going to be off the rails if we don’t get some new leaders in Washington, $16 trillion debt, over a trillion dollars to China, Social Security, Medicare, bankruptcy. GLENN: How do we not collapse ourselves by trying to heal ourselves? GLENN: So how aggressive are you talking? You know, when Calvin cool age came in, he and Harding, they put the spending by 50%. GLENN: How aggressive, how aggressive do you think we should be? MANDEL: We have to be very aggressive. We need to do a top/bottom review of the federal government and for every agency administration bureaucracy that is not called for in the United States Constitution, we have to really ask the question what is its purpose, how many people work there, how much does it cost the taxpayers and what is the value to our society. GLENN: If we wouldn’t be sued by Barry White, I would play Barry White right now and turn the lights down. MANDEL: Hey, Glenn, I have someone here who wants to say hello. MANDEL: I do know that. GLENN: And thank you for your service. And I can’t wait until you get to Washington and start pulling the bodies out. MANDEL: I appreciate that. You know, it was my honor to do my small part and do a couple of tours in Iraq and it sickens me to see when our Americans are killed overseas and abroad and I ‑‑ this is just disgraceful how this is playing out with Benghazi. And I’ll tell you something else, just while you’re on this topic. I didn’t like those comments the president of the United States made to Governor Romney at the debate about bayonets and horses. When I went through Marine boot camp in Paris Island, South Carolina, we actually did have bayonets that we trained with. And as a Marine if Iraq, I actually did have a bayonet that I wore on my flak jacket and I just think the commander‑in‑chief of our military needs to be more respectful of our men and women when he’s making comments about our military and he should really understand who it is out there carrying a weapon and protecting our country every day. GLENN: And I know I have Marco Rubio waiting but I mean, you’re an official in Ohio. How concerned are you on the stealing of the election in Ohio? MANDEL: Ballot integrity is definitely a big issue here. I mean, I was down by the board of elections the other day and there’s just vans and vans and vans of people being dropped off there to vote and obviously the default is giving ‑‑ is believing the people are following the law and doing everything legally within the bounds, and I’m ‑‑ I hope and assume that’s happening. But at the same time with such a volume of people voting early here in Ohio, we need poll watchers and we need folks keeping eyeballs on every ballot site. But I think it’s also important, Glenn, that those poll watchers are Americans. I don’t know if you caught this. GLENN: I don’t know how Ohio handled it but Texas said, go to hell, we’ll arrest you if you come in. MANDEL: Yeah. Over my dead body. GLENN: Exactly right. Thank you very much, Josh. MANDEL: So if any of your listeners want to help us out here in the last week, our website’s pretty simple. It’s JoshMandel.com. MANDEL: Let me pass out the phone. We’ve got Senator Marco Rubio here. We’re calling you from Joe’s Diner in Ohio. MANDEL: Joe Biden’s not here but Marco sure is. Hang on one second. RUBIO: Glenn, good to talk to you. GLENN: Hey, senator, how are you? RUBIO: I think people understand the choice of this election is not just between two people. It’s between two very different views of our government’s role and our future and what America should be, what America should remain. And, you know, I think you’re starting to sense that from people as you talk to them. GLENN: Oh, I tell you I think you’re going to see a miracle on Tuesday. I really do. I mean, a miracle as far as the distance between the two. I think America is wide awake. They’ve just had enough. They’re quiet about it. It’s like my grandparents. My grandparents didn’t have to say anything. They would just go do it. And I think that’s what’s going to ‑‑ that’s what’s going to happen. RUBIO: Yeah, I think that as well. GLENN: Is ‑‑ how do you think things are going to fare for Romney in Ohio and Florida? How close? RUBIO: Let me start with Florida, yeah, because that’s ‑‑ obviously live there and spend a lot of time there. I feel great about Florida. The analogy I always use is I know people who voted for Barack Obama in 2008 that are going to vote for Mitt Romney. I don’t know anyone who voted for John McCain that’s going to vote for Barack Obama this time. I know that’s anecdotal but I think that’s the feeling people have. There’s a lot of disappointment. Some people just kind of bought into the 2008 notion that, you know, he’s ‑‑ let’s try something different, he’s going to unify our country, he’s going to bring us together. And it’s just been a disaster. I mean economically, politically, all the way around. And people are just ready to walk away from that and kind of go back to the free enterprise system which made us the most prosperous people that have ever walked the Earth. GLENN: I am really concerned about what’s happening in Benghazi. GLENN: ‑‑ serious investigations because we are ‑‑ what we have is a president that let guys die and a lot of people watched them die in realtime. There’s a massive coverup on this. And beyond that, you’ve got at least ‑‑ you’ve got anywhere from 25 to 500 people who know and are now having a hard time sleeping at night. And if those guys are allowed to let that just cook in their soul, man, we go really dark. It’s not good. We’ve never been that way as Americans, to leave just people die. RUBIO: Yeah. Two things are happening. On the one hand I think there’s a very serious concern that I have and I think it’s a legitimate question to ask and that is, is the reason why they spent two weeks telling us that this was the result of a spontaneous uprising, is the reason why they’re saying that because it went counter to their narrative that Al‑Qaeda had been defeated, Bin Laden was dead and the world was safer. And then they bragged about this for months. It was a key part of their convention. Obviously we’re very happy Bin Laden is dead, but Al‑Qaeda unfortunately has reconstituted itself in North Africa including Libya. So that’s the first element of it. The second is that there’s clearly something going on here in terms of our different agencies to be able to interact and coordinate and make the right decisions in a timely fashion to save lives. So we’re going to have what they call classified hearings. But I’m going to push for open hearings as well. And by the way, these hearings should have happened a long time ago. RUBIO: They shouldn’t be happening after the election. And there’s a lot of information out there that’s going to be classified that shouldn’t be classified. There’s no reason to keep it that way. The American people have the right to hold their government accountable for its failures, A, so that the people who did it can be held accountable and, B, so that it never, ever happens again. GLENN: Thank you very much, Senator. You and you keep going and we wish you luck that I think the real hard work for America begins on Wednesday. RUBIO: Well, thanks for what you’ve been doing for years all the way back to the 9/12 movement and your involvement in that years ago. It really began in ’09 right after the election when folks like you raised your voice and began to educate the American people about what was going on. That led to the big wave in 2010 that allowed me to get elected and the wave in 2012 that’s going to give us a new president and is going to give us Josh Mandel. GLENN: Well, just don’t ‑‑ don’t let us down. One quick question. How worried are you about the lame duck session? RUBIO: I’m worried. I mean, a lot of bad things happen in lame duck sessions. You have folks who are never going to run again who don’t feel like they’re accountable. You have a lot of ‑‑ you know, they will package a couple of good ideas with ten bad ones and tell you that’s the way business is done, that’s the only way to get things done. So I am concerned about some pretty bad policy happening in the lame duck. You know, we got that START treaty with the Russians and a couple of other things that were not good for our country as well. GLENN: Thank you very much, Senator, appreciate it. GLENN: We’ll talk again soon. PAT: I liked Josh Mandel, too. Liked him. PAT: He knows what he’s talking about. GLENN: He knows what he’s talking about. He’s a Jewish American, strong on Israel. I mean, he gets it. PAT: There’s hardly anybody better. STU: I will say I maintain ‑‑ a lot of people said they liked the Clint Eastwood thing and whatever, you liked it or you didn’t like it. One of the worst things that happened in that convention was that Clint Eastwood thing took all the attention from Marco Rubio’s speech which was one of the best speeches by a Republican that, I mean, I can remember. PAT: And it got no attention at all. STU: I mean, here’s a guy who’s really smart, different. Obviously the optics are good on politically and demographically. It’s just one of those things that Marco Rubio needs to be heard. GLENN: He’s really, really effective. STU: Josh Mandel was great, too. That’s the first time I heard him in an extended area. He’s great. GLENN: I talked to him in Ohio last time. I met him backstage and we spent about ten minutes together. He’s really sharp. He’s really sharp. GLENN: Come on, Ohio, come on. GLENN: Come on, Ohio. Remember how pissed you were at Florida? GLENN: Yeah. That’s the way we’re going to be with you. PAT: You don’t want none of this. GLENN: No, you don’t. We’ll come up there and give you such a hit.